" For the art of the icon is ultimately so to transform the person who moves towards it that he no longer opposes the worlds of eternity and time, of spirit and matter, of the Divine and the human , but sees them as united in the one Reality, in that ageless image-bearing light in which all things live, and move and have their being "
Ann organises and teaches annual classes at Oare Village Hall, would-be participants can contact Ann by clicking here. Ann organises workshops in Lesvos for her Russian teachers, those interested may contact her by clicking here to be included on the waiting list. Ann Welch has always had an interest in medieval art and design . She worked as a display artist for the iconic firm Liberty of London from where she developed her love of fabric design, and it was from this period of her life that her interest was peeked in the art and history of the Byzantines. This interest became more developed during her travels in Greece . 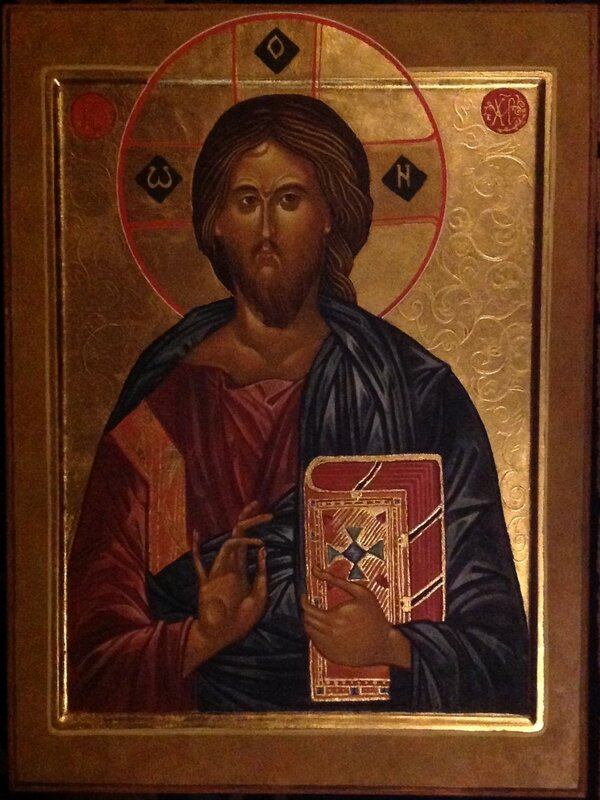 She started her studies in Orthodox iconography whilst on the island of Lesvos due to instructions received in a dream. She inquired of the local priest where she could learn and he sent her to her first teacher Kostas Skordelis who trained as an iconographer in Mount Athos. 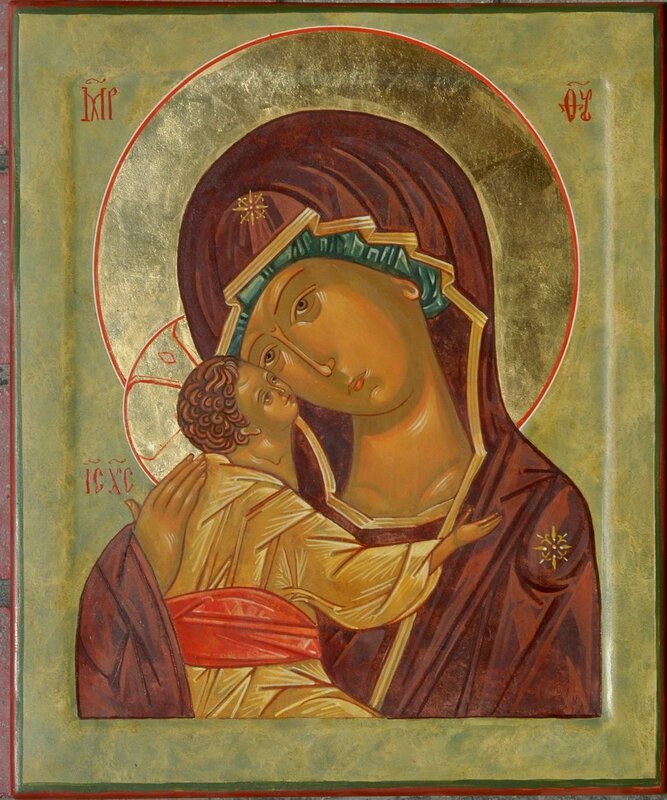 In New York she attended classes in Byzantine Art Technique with Barbara Meise, a restorer at the Cloisters Museum NYC, after which she attended the classes of Vladislav Andreyvev at the School of Sacred Art, part of New York University. Over the years she has continued studies with Sergei Taracyan, Elena Antonova, Stephane Rene (www.copticiconography.org), Aidan Hart (www.aidanharticons.com) and Theodoros Papadopoulos (www.theodoreicons.com). Whilst living in Rochester UK she was given the opportunity to introduce the people of Medway to this Sacred Art , the first course on the subject at an Adult Education Institution in UK. Iconography classes are often not accessible to those on a lower income and for those suffering from debilitating disease and Ann felt this was important. She did this for 15 years and also started a group in Swale at Oare. From these groups others have evolved such as the group in Higham and Amanda de Pulford's classes at Minster Abbey in Thanet. For those students who have a keen interest she is able to direct them to masters in the field. In 2009 she conceived, curated the ' Divine Dimensions' installation at St Peters Church , Oare. This project was a recipient of a Heritage Lottery Fund Grant . An Iconostasis was erected in the place where the 17 th century rood screen once existed and international Iconographers were invited to display their work upon it. The church, for three weeks of the Canterbury Festival had the appearance of an Orthodox church complete with the scent of basil which volunteers had grown over the summer to fill the porch . The show which was opened by Robin Cormack could not have taken place without the support of Rev Carolin Clapperton, Amanda De Pulford, Emma Daniel, Lucie Neame and many other wonderful volunteers. There were many events and speakers and services from three denominations, the first being Vespers from the Orthodox Eucharistic Community of St Theodore, himself a Greek Archbishop of Canterbury presided over by Arch Priest Father Alexander Fostiropoulos. Ann's icons are to be found in various churches in Kent, Rochester Cathedral where her work is featured in two published guides and on the island of Lesvos, Greece. She was featured in an article about her work in a Slovakian publication. ' Aside from the Tumult' was an article by Ann published in ' The Tablet' in 2010. She is an active member of The British Association of Iconographers and participated with members of the Prosopon School at the 'Star of Bethlehem ' exhibition at Pushkin House, the Russian Cultural Centre, London. She was interviewed for the Mytilene Television station and was featured in ' Country Ways ' in their programme of Oare.